When most uniform companies say that they make "Custom Restaurant Uniforms" what they mean is that you can get a polo shirt, apron or chef coat with your logo embroidered on it. Crooked Brook is a unit of the atelier division of an art studio that offers full service apparel design, pattern making, sample making, private-label small lot production and embroidery. In addition to embroidered and printed brand name apparel and accessories, we also offer jackets, vests and uniforms made according to a customer’s fabric and style specifications. In some cases, we make garments from customer supplied fabric, closures and an individual pattern according their measurements. All Crooked Brook branded garments and accessories are proudly made to order in the U.S.A.
With our in house pattern making, cutting, sewing, logo digitizing and embroidery, over 450 embroidery thread colors, 55 piping colors, large variety of styles, dozens of fabrics (including Supima® and Certified 100% Organic Cotton Twill), and an extensive line of buttons to choose from, you can design your uniforms in ways you never imagined. If this is of interest to you, please call 315-733-1992 or email us at info@crookedbrook.com to discuss your ideas. Below are some our chef coat styles shown in various styles, colors, and added options. Some are made in customer-supplied fabric. 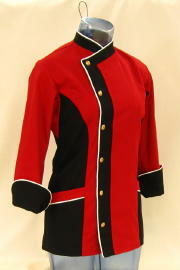 These are just a few examples of custom chef jackets we have done in the past. ● Contrasting color side panels, collar and cuffs. 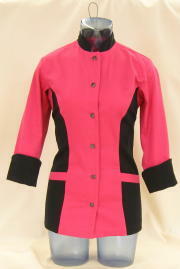 ● Contrasting color side panels, collar, front placket & cuffs. 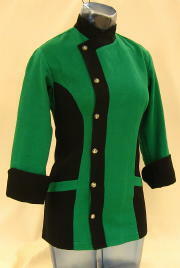 ● Contrasting color collar, front placket & cuffs. ● Russet piping; collar, front & cuffs.